The Parliament of Jamaica is the legislative branch of the government of Jamaica. 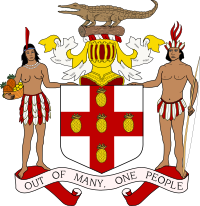 It consists of three elements: the Crown (represented by the Governor-General), the appointed Senate and the directly elected House of Representatives. The Senate (Upper House) – the direct successor of a pre-Independence body known as the "Legislative Council" – comprises 21 senators appointed by the Governor-General: thirteen on the advice of the Prime Minister and eight on the advice of the Leader of the Opposition. The Parliament meets at Gordon House at 81 Duke Street, Kingston. It was built in 1960 and named in memory of Jamaican patriot George William Gordon. As Jamaica is a parliamentary constitutional monarchy, most of the government's ability to make and pass laws is dependent on the Prime Minister's ability to command the confidence of the members of the House of Representatives. Though both Houses of Parliament hold political significance, the House of Representatives of which the Prime Minister and the Leader of the Opposition are both required to be members of holds a more powerful and prestigious role since it is the main source of legislation. The House of Representatives is the Lower House. It is the group of elected members of parliament. Senator The Hon. Pearnel Patroe Charles Jr.
^ "Contact Us". Japarliament.gov.jm. Retrieved 3 January 2016. ^ "History". Japarliament.gov.jm. Retrieved 3 January 2016.